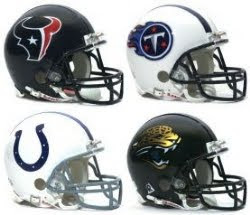 We conclude our division-by-division previews with the AFC South. With Peyton Manning out for what looks to be at least most the season, 2011 will see an AFC South in flux. It’s as if the stars are aligned. Has there ever been a more perfect set of circumstances for the NFL’s youngest team to make their first post-season trip in the short history of the franchise? They are coming off a season where they had one of the hottest and most dynamic offenses in the league – being one of only two teams to finish in the top 10 for passing, rushing, scoring and total offense (the Eagles being the other). Their defence, which last year was so bad it finished in the bottom 5 in all of those same categories except for rushing, is expected to improve considerably with the hiring of Wade Phillips as defensive co-ordinator. Most importantly, the Indianapolis Colts, long the dominant force in the AFC South, is on the verge of a full-blown meltdown with Peyton Manning questionable to be under centre when the season starts – and even if Manning does make it on to the field for week 1, there is no telling how good or poor of shape he’ll be in. Lastly, Gary Kubiak is feeling his seat’s temperature constantly rising, with the team finishing last season with their worst record since Kubiak’s first year as head coach in 2006. Kubiak knows that the Texans’ time has to be now – or else he’ll be looking for work come March. Let’s start with the obvious one. The Texans happen to have one of the best, if not the outright best wide receiver in the league in Andre Johnson. Despite having the NFL rushing yard and yards-from-scrimmage leader in Arian Foster, Johnson still led the league in receiving yards per game with a 93.5 yard average. When you’re still putting up those sort of numbers despite having Arian Foster as part of the same gameplan, you know this is a special player. Johnson even finished sixth in the league in yard and receptions despite missing three games last year. In some ways, it’s pretty superfluous to need to talk about Johnson. Is there anyone who thinks he isn’t at the very least a top 5 wide receiver in the league right now? The stats tell it all: over the past five seasons, he has finished four with over 1000 receiving yards; two of those were over 1500. In that time span, he’s led the league twice in receiving yards, twice in receptions, and three times in yards per game. Just a ridiculous human being. So, the Texans have the best receiver in the league, but for an offense to be successful it cannot be one-dimensional. So how’s the run game looking? Not too bad, actually. Exploding out of pretty much nowhere last year, Arian Foster led the league in rushing yards and yards from scrimmage, as well as rushing touchdowns. He also finished in the top 10 for rushing yard per carry despite having the third most rushing attempts in the league, which if anything you would expect to reduce that average. Of course, the question is whether or not he can repeat such a performance. Two big factors: firstly, he has an injured hamstring – I’m sure you’ve all seen the MRI by now – and he lost a beast of a lead blocker when fullback Vonta Leach left in free agency. Luckily for Foster, the first two weeks sees the team taking on an Indianapolis Colts team in utter disarray, and a Miami Dolphins team that think Reggie Bush can provide an adequate run game, which he can’t, so that game’s more likely to become a Henne-to-Marshall/Schaub-to-Johnson shoot out anyway, so I don’t believe the team will rush Foster back if he’s not ready. Will losing Leach hurt? Of course. But by hiring Wade Phillips as defensive co-ordinator, the Texans are expecting to be much improved on that side of the ball. And if the defence can lock down opposing offenses, then the gameplan will change for the Texans from ‘need to outscore the other team’ to ‘control the clock’ – and that comes from running the ball. Foster might not do quite as well without Leach, but when the Texans transition to that second, clock-control mentality, then the gameplan will be designed around Foster – and that will do him just fine. There is an expression in Britain: ‘the proof of the pudding is in the eating’. Translation*: Wade Phillips bringing his version of the 4-3 defence (can we please stop calling it a 3-4? I don’t care if Mario Williams’ hand is off the ground; in the same scheme last year, DeMarcus Ware dropped into coverage a total of six times. Six times! I swear the average 4-3 end drops into coverage more often than that. It’s definitely a 4-3, just with one of the DEs in a two-point stance. Let’s call a spade a spade, k?) to Houston, and signing Jonathan Joseph, who is one of the best corners in the league and doesn’t get enough recognition for it, in free agency ought to make the Texans a much better team on defence; but just because the defence pudding looks tasty, we won’t know until we eat it… with our eyes… by watching them on the field. Ok, I stretched the metaphor a little too far, but the point is this: the Texans’ D was absolutely atrocious last year, and until they can prove that they’ve stepped up their game, there’s no question it has to be considered a weakness. It’s really, really tempting to give this to AJ. So I’m going to. With Foster hurt in the beginning, AJ’s going to get the ball a lot, and I only count three corners that could really have much negative effect on him at all before the bye week. It’s a tie between all the running backs on the roster. It didn’t feel right naming Foster as disappointing, because A) it’s hardly his fault he’s injured and B) this isn’t about fantasy. For Texans fans it’s going to be disappointing in the beginning because he’ll take a few weeks to find his groove again, but these things happen when coming back from injury. The guys behind Foster won’t be able to match the production levels Foster usually brings – Derrick Ward will be starting in Foster’s absence? Really? Derrick Ward? Ask my Bucs how he turned out in ’09 – so I’m predicting a disappointing first half of the season for the whole Texans’ backfield. It’ll pick up when Foster’s back at full strength though. The Texans start off with two easier games against a Manning-less Colts and the Dolphins, before things get a lot harder with a trip down to the Bayou to take on the Saints before hosting the Steelers. Weeks 14-16 should provide a relatively easy stretch for the Texans to make their playoff push, with games against the Bengals, the Panthers, and the still Manning-less Colts (by week 16? Yes. Manning’s done. I’ll elaborate below), before a final game against the Titans that could well be the decider in who takes the division crown. No, I’d never heard of him either. It turns out, he is, on paper, the offensive co-ordinator of the Indianapolis Colts. How much of an influence does he have on the team’s offensive gameplans? Well, I’m not sure. For all I know, he might be, behind closed doors, considered to have a greater offensive mind than Bill Walsh and Vince Lombardi put together. But how much do the public know about him? Well, here is his Wikipedia page. Impressive stuff, eh? Now taking it seriously: the Colts are in trouble. Deep, deep trouble. I’ve joked recently that the Colts offensive co-ordinator must be terrified at having to actually do his job for the first time ever. Except I’m really not sure if it’s a joke or a statement of fact. The Colts are pretty much the only offensive powerhouse who get by with no discernable run game whatsoever, and that is down to the complexity of the passing game. Except none of that complexity comes from the co-ordinator, it’s all down to Peyton Manning. 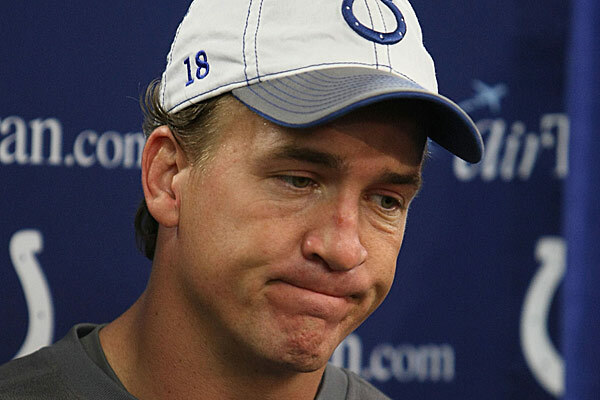 The Colts have picked up Kerry Collins, but he will not be able to come close to what Manning does. Forget the actual throwing the ball, that’s not where the drop-off will really be felt (although of course there will be a drop-off). It will come in the playcalling, which will either see the Colts having to huddle up constantly for the first time years and years, giving the opposing D a lot more time to prepare for the play, or else have to run a far more simplistic version of the no-huddle, which will mean opposing Ds know there are a lot fewer possible plays coming, so again can take more time in preparing for the play. Quite frankly, for years the Colts have just assumed Manning would be there to carry the team on his back. Now they’re finding out that he’s not just the key to their team, he was their whole foundation – and now they’re crumbling. The Colts have arguably the best pair of starting defensive ends in Dwight Freeney and Robert Mathis, at least in the passing game. The Colts may as well not put anyone on the field when the other team runs the ball, but if they decide to pass it, Freeney and Mathis can put a ton of pressure on opposing quarterbacks, which leads to hurried decisions and bad throws. In 2011, this will be the only aspect of the team that Indy fans can be proud of. I feel sorry for Kerry Collins. There is nothing he can do to salvage this season for the Colts, their whole essence was reliant on Manning being there, and now that he’s not… Even if Collins was brought in the moment free agency started, there would never have been enough time for Collins to learn how to think like Peyton, and that, really, is what made this offense work: not Peyton’s arm but his brain. Bold statement time: the starting quarterback for the Indianapolis Colts in 2012 is not currently on the team’s roster. Peyton Manning has taken his last snap in the NFL. I won’t go into detail, but due to recent circumstances I have learnt a lot about spines, and Manning’s recent procedure is pretty much the end of his career. The procedure itself, fusing a part of the spine in the neck area, is not automatically career ending (as it almost certainly would have been if it was a fusion lower down the spine), but he definitely won’t be playing in 2011. So why will he not play next year? Because of his recent, $90 million contract extension. There is no guarantee how well Manning will be able to play again, should he decide he wanted to play despite the added risk of long-term injury thanks to the recent procedure. According to Michael Lombardi, there is an opt-out in Manning’s new contract: they’ve already guaranteed him the 2011 portion of the contract, but after this year they can tear the contract up, only having to pay him an additional $1.5 million to do so. That opt-out disappears if he plays in 2012. Will the Colts really tie up so much of their salary cap over the next four years for a QB who might never come close to his pre-injury form? And, again, that assumes that Manning won’t decide to hang it up rather than risk an even worse injury. The Colts will probably be picking in the top 10 next year anyway: Bill Polian must be praying that the Panthers end up with the #1 pick again next year – if that happens, expect him to trade the farm to move up and grab Andrew Luck. (Why only the Panthers? Because I believe they are the only team who are likely to end up with the 1st pick in the draft that would actually not take Luck. They’ve cast their lot in with Newton, for better or for worse). Adam Vinatieri. He will be the main factor in preventing sixteen Colts shut outs this year. Joseph Addai. Addai’s never stepped up as a running back, but people put up with it as it was such an irrelevant part of the offense. He’s going to be under a lot of scrutiny this year. If Mathis can get pressure on Colt McCoy (Freeney will be locked up by Joe Thomas), and the Browns’ D haven’t settled into their new 4-3 scheme, the Colts might scrape a win in week 2. They also face the Bengals, and the Panthers. Every other game on the schedule, you can go ahead and put an L in the win/loss column now. Once upon a time, in an earlier draft of this piece, the storyline for the Jaguars was going to be about whether or not Blaine Gabbert waiting in the wings would be a distraction for the team. Well, Jack Del Rio went and scuppered that by releasing David Garrard five days before their first game of the year. Del Rio has done this sort of thing before – cutting Byron Leftwich right before the 2007 season – and it worked then, winning a wild card spot and making it to the divisional round of a the playoffs. This time, don’t expect it to work out as well. With Garrard gone, the starting QB this year will be Luke McCown (who, coincidentally, lost the quarterback competition in Tampa Bay in the 2009 preseason to Leftwich), but it’s pretty clear that McCown’s only holding the fort until either this year’s first round pick, Blaine Gabbert, has learnt enough to take over the reins, or until they’ve lost enough games where it doesn’t make much difference who’s under centre, so they may as well give Gabbert some game experience. Either way, it seems Del Rio isn’t really interested in being competitive this year, but is more interested in rebuilding the team for the future. If he were a first time head coach he could get away with it, but heading into his ninth season in charge of the Jags? I’m guessing he won’t be around to see the rebuilding come to fruition. Maurice Jones-Drew is one of the top running backs in the league. Coming off back-to-back Pro Bowl seasons, the Jags are going to lean heavily on MJD this year until the quarterback situation resolves itself. Despite scoring the least amount of rushing TDs in his pro career last year, he still rushed for over 1300 yards despite missing two games. With Rashad Jennings gone on IR, this year will be a huge one for Mojo. Are you getting déjà vu yet? The AFC South is just not a great division for defence. The Jags made some very nice moves in free agency to shore up this side of the ball, picking up Paul Posluszny, Dawan Landry and Drew Coleman. Again, though, I need to see the proof before I can say the 5th worst defence in 2010 (also 5th worst rushing defence, 11th worst passing defence) is no longer a weakness. Again, this wouldn’t have been a weakness last week (not that would have exactly been a strength, but it wouldn’t have actively hurt the team). But Luke McCown, who I like, isn’t a starting-grade QB, and the lockout has meant that Blaine Gabbert simply hasn’t had enough time to learn the ins and outs of being an NFL-calibre signal caller. It will be a tough year for Jacksonville. Marcedes Lewis. A good receiving tight end can be a quarterback’s best friend – especially a young QB. I believe Gabbert will be starting sooner rather than later, and a sure-handed TE who can act both as a safety-net to dump the pass off to, and be a very viable red zone threat, will help the Mizzou alum’s development immensely, while also securing another Pro Bowl-worthy year for himself. Mike Thomas. The factors that will give Lewis a good year are the same factors that will hurt the third-year receiver. Gabbert won’t yet have learnt how to read the game quick enough to see routes developing, and he won’t have the experience yet to read pressure correctly. This means he will look for the short dump-off more often than not, especially after the inevitable rookie interceptions leave Gabbert a little gun-shy, and that could see Thomas left out in the cold. Six of the Jaguars’ first eight games are against the Titans, the Jets, the Saints, the Steelers, the Ravens and the Texans. I expect them to lose all six. The second half of the year should see the team going 4-4, however, as the defence by then should have gelled enough to deal with the Browns and the Titans the second time around. This division really ought to belong to the Texans this year, especially once Foster gets it going again. If there is one team that can take the postseason away from Houston, it’s the Titans. Like Jacksonville, the Titans have a young QB, and the future face of the franchise, in a backup role; but unlike the Jaguars, the QB who’s starting the season is actually decent enough that the team can plan on not seeing Jake Locker take any opening snaps this year. Yes, Matt Hasselbeck is not the Matt Hasselbeck of old, but in a very fluid AFC South, he could be good enough to get the team at least an 8-8 record, although don’t hold your breaths for Tennessee to make the postseason. Being honest, I really was not expecting the Titans to pay Chris Johnson, at least until Hasselbeck went down to injury (which he would have done with CJ2K in the back field). But they shelled out for him, and the Titans instantly look a much more credible threat offensively as a result. The Titans will really only ask one thing of Hasselbeck: throw often enough to try and keep defences honest; because if they don’t believe the Titans’ passing game can up at least one or two scores a game, they will load the box with at least eight defenders every single down. Chris Johnson really is that huge of a threat. Matt Hasselbeck is an old man, but he continues every year, undeterred, pushing the raft out again and again to try and finally capture a Super Bowl ring. Like Hemingway’s character, it will never quite come to pass; only in this case, it won’t be mako sharks chomping away at a giant marlin, but rather a shallow receiving corps and a weak defence that will destroy his dreams this time. However, just like Santiago, Hasselbeck will not give up on the team, and he will fight his way through December. Yes, this is a bit of a weird thing to put as a ‘strength’, but you’ve got to think that Jake Locker will learn a hell of a lot from the sidelines about what it means to be a leader in the NFL. When the Titans make the playoffs in 2012 under Locker, it will be because of Hasselbeck’s example this year. Give me a D! Give me an E! Give me an F! Can you see where I’m going with this? Titans defence in 2010: 20th in run defence. 29th in pass defence. 26th in total defence. Titans’ solution? Obtain Barrett Ruud to be the middle linebacker of your defence. As a Bucs fan, let me tell all you Tennessee fans a secret: you will never, ever see a defence that is better lined up in your lives. No matter what personnel package or formation the opposing offence comes out in, Ruud will check into the prefect coverage to counter it. In many ways, he could be the best MLB in the game. If he knew how to tackle a running back before they’ve gained five yards. Or if he wasn’t so bad at shedding blocks you could believe that all offensive linemen were covered in industrial glue. If you have one of the elite running backs in the league, you need to find a way to keep opposing defences honest. There’s a very effective way of doing that: a good collection of receivers. The starters are fine, they hardly set the world alight but Britt and Washington would be OK… if there was a third guy you could play in the slot, or at tight end. Neither of the three tight ends that played for the Titans last year put up more than 360 yards on the season. Bo Scaife is fine for the red zone, but you need to get there first. On the WR side, the only other two wide receivers to start more than one game for the team were Randy Moss and Justin Gage – neither of whom are back with the Titans. With Chris Johnson as your running back, you either need a scarier starter than Britt or Washington, or a real 3rd receiving threat to clear out the box for CJ. That’s not happening with the roster they have now. As a Bucs fan, I’m going to say Ruud. It’s just maddening how large the gap is between all the intellectual and intangible positives he brings to the table, and the absolute lack of physicality that comes along with it. Between the Panthers, Colts (twice), Browns, Bengals, Broncos and Bills, there’s no excuse to win less than seven. If they split the series with both the Jaguars and, depending on how improved the Bucs’ front seven are, the Titans could head into Houston in week 17 looking to secure a 10-6 season.